Pemphigus vulgaris (PV) is an autoimmune blistering disorder of mucous membranes and skin and commonly affects adults between ages of 40 and 60 years. Childhood PV (CPV) is a rare entity (0.1–0.5 cases/100,000 inhabitants/year) and comprises only a small minority of the vesiculobullous disorders seen in childhood. The age of the onset varies from 13 to 19 years with similar clinical, histological, and immunological features as seen in adult PV (APV). Autoantibodies are primarily directed against desmoglein-3 (Dsg3) with or without the concomitant involvement of Dsg1. When mucocutaneous lesions are present, PV patients can also present with antibodies against Dsg1 which is indicative of a poorer prognosis of the disease. These autoantibodies lead to the destruction of cell–cell cohesion and blister formation. 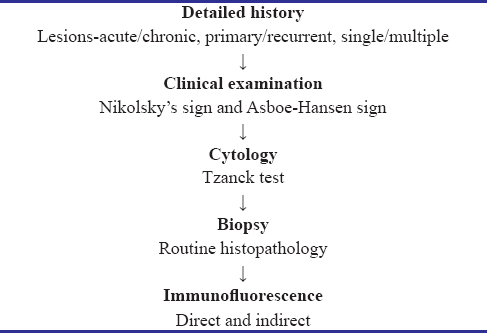 The sequence of diagnostic procedures in a suspected case of vesiculobullous disorder after a detailed history and comprehensive clinical examination may include Tzanck test (TT) as the first step, the findings of which can be further substantiated by routine histopathology and immunofluorescence. In this article, we present two case reports of CPV along with a brief discussion of the diagnostic approach in such patients. A 10-year-old male patient presented to our outpatient department with the chief complaint of painful oral erosions for the past 10 months. His past dental and medical history was noncontributory, and there was no family history of any such oral lesions. There was also no complain of anorexia, fatigue, or recent weight loss. Intraoral examination revealed extensive superficial erosive lesions on the bilateral buccal mucosae, tongue, labial mucosa, gingiva, and posterior part of the palate. A single ulcer measuring 0.5 cm × 0.8 cm was noticed on the dorsal surface of the tongue. No such lesions were present on the skin [Figure 1]a. A differential diagnosis of herpetic gingivostomatitis and vesiculobullous disease such as pemphigus was made. Herpes infection was ruled out due to the chronicity of the presented lesions and lack of viral prodrome of fever, anorexia, and malaise. With a clinical suspicion of pemphigus, TT was performed on the same visit free of cost in oral pathology department. Smear sample was obtained from multiple sites. On hematoxylin and eosin (H and E) staining, smear showed numerous acantholytic cells present both individually and in clusters. The keratinocytes were large, round, and darkly eosinophilic with hyperchromatic nuclei [Figure 1]b. Based on the history, clinical presentation, and cytological finding, we arrive on a provisional diagnosis of pemphigus. Further biopsy and direct immunofluorescence (DIF) were advised for confirmation. Although the biopsy findings on H and E were inconclusive due to insufficient tissue sample, DIF showed intercellular positivity for immunoglobulin G in a fishnet pattern confirming our initial diagnosis of PV [Figure 1]c.
Early diagnosis is important in PV as this disease can be controlled by lower doses of medication used for the shorter period of time in initial stages. The patient was referred to the department of oral medicine for management where he was given betamethasone 1 mg tablet (squish and spit), topical triamcinolone, and analgesic gel thrice daily for 2 weeks. After 14 days of treatment, the patient showed satisfactory improvement of the lesions [Figure 1]d. The patient is being followed up for 9 months without any recurrence of the lesions. A 12-year-old male patient reported to our institute with a history of painful oral erosions and ulcers that resulted in odynophagia for 6 months. Past medical and dental history was noncontributory. Intraoral examination revealed small ulcers and erosions with slough on the buccal mucosa, labial mucosa, ventral surface of tongue, and floor of mouth [Figure 2]a. Due to chronicity of the lesions and extensive involvement of oral cavity, a provisional diagnosis of pemphigus was reached. TT was performed on the same visit which showed large, round, and darkly eosinophilic acantholytic cells with hypertrophic, hyperchromatic nuclei [Figure 2]b. Based on the clinical and cytological findings, a provisional diagnosis of PV was reported, and the patient was referred to dermatology department for further management. The patient was given tablet prednisolone 20 mg OD in tapering dose, tablet betamethasone 1 mg TDS (squish and spit), and topical application (2% w/w) for 7 days. The patient was followed up after 7 days with healing lesions [Figure 2]c. For remaining localized lesions, the patient was given topical application of triamcinolone thrice daily for 1 week. The steroids were tapered down gradually. There were complete healing and resolution of the lesions after a period of 3 weeks. The patient is kept on regular follow-ups for the past 10 months without any recurrence of lesions. PV occurring in young patients (<20 years) has been given various terminologies such as juvenile PV, adolescent PV, CPV, and pediatric PV. It has been suggested to use the term “CPV” for patients below 12 years and “adolescent PV” for patients between 12 and 18 years. The mean age of the onset for CPV is 12 years, with the age of onset being lower in boys than in girls. It equally affects males and females (M: F = 1:0.96) in contrast to slight female predominance in APV. CPV is extremely rare in children below 10 years, and peak incidence is noted at puberty. The youngest male and female patients reported with CPV are 3 and 4 years old, respectively. Clinical presentation of CPV is similar to APV presenting with flaccid vesicles which on rupturing produces erosions and subsequently crusted lesions. On an average, oral symptoms precede systemic illness by 2 years. The oral lesions usually affect the gingiva, buccal mucosa, lips, and soft and hard palate. These lesions can further show the cutaneous involvement of the face, trunk, breast, back, and groin areas. Histological and immunological features of CPV are also similar to APV. Immunosuppressive drugs are the principal drugs used, and a dose of which should be adjusted according to the age, weight, disease severity, and drug side-effects in the pediatric patient. Prednisolone is the drug of choice and its dosage is adjusted according to the clinical response and gradually tapered in the cases which show improvement. Drugs can be completely stopped when the lesions disappear; however, a maintenance dose (5–20 mg/dl) may be required in some patients. When substantial doses of steroids are to be used for the longer course of treatment, it is recommended to incorporate adjuvants therapy such as immunosuppressive drugs such as mycophenolate mofetil and azathioprine. Patients having only oral involvement may be managed by short course of small doses of prednisolone alone, and hence, in our patients, no adjuvant therapy was used. Many ulcerative and vesiculobullous diseases of the mouth may have similar and thus confusing clinical appearance. A brief history followed by hasty clinical examination is often insufficient and leads to incorrect diagnosis and hence inappropriate treatment. A detailed and comprehensive history provides information that supplements clinical examination and guides the clinician through it. Three sections of information need particular attention: duration of lesion (acute or chronic), the past history of similar lesions (primary or recurrent), and the number of the lesions (single or multiple) present [Table 1]. Differential diagnosis of PV may include acute viral infections, erythema multiforme (EM), and recurrent aphthous stomatitis (RAS). A comprehensive history can differentiate chronic multiple lesions of PV from viral infections and EM because of the acute nature and self-limiting course of the latter diseases. In RAS, lesions are round and symmetrical which usually recurs after healing. There are no tissue tags present in RAS from ruptured lesions which help in distinguishing it from diseases that start as vesicles such as pemphigus. Whereas in PV, lesions are irregular which continue to extend peripherally. Nikolsky's sign, Asboe-Hansen sign, and Lutz sign may also help in the clinical diagnosis. Cytodiagnosis is a very simple, inexpensive, rapid, and reliable diagnostic tool. Hence, it may be used as an adjunctive tool on routine basis in certain vesiculobullous disorders such as PV and also in herpetic infections. Even though acantholytic cells may be noticed in certain other disorders, they are seen in substantial numbers in pemphigus  [Table 2]. TT is especially useful in the early stages of PV, when a biopsy is uncomfortable to the already troubled patient. For this purpose, a smear is taken from the underside of the roof and from the base of an early, freshly opened bullae. It reveals acantholytic Tzanck cells which are large round keratinocytes with abundant basophilic cytoplasm having hypertrophic nucleus and hazy or absent nucleoli. The cytological features in pemphigus vegetans are identical, but there are more inflammatory cells, especially eosinophils. The acantholytic Tzanck cells in pemphigus foliaceus and pemphigus erythematosus as compared to PV often have a more hyalinized cytoplasm that corresponds to the dyskeratosis seen in tissue sections. In the hands of an experienced pathologist, TT as a diagnostic adjunct can help to establish the clinical diagnosis with simplicity and rapidity. Previously some authors have stated that PV can be diagnosed solely on cytological findings. In our experience, TT appears to be a reliable adjunct in the diagnosis of PV as all positive tests were later confirmed positively by biopsy and DIF. Since the TT can be performed with minimal discomfort and can be repeated in apprehensive and pediatric patients, it carries its own importance among diagnostic techniques. Furthermore, previous studies in the available dermatology literature have shown high accuracy of TT in the diagnosis of dermatological diseases due to which it is considered as an important diagnostic tool. Blank and Burgoon  and Yaeen et al. showed 93.3% and 71.4% positivity rate of TT, respectively. The classical lesion in PV is a thin-walled bulla which breaks rapidly. However, biopsies on intact vesicle and bullae which are <24 h old yield best results. Due to rarity of these lesions on oral mucosa, the biopsy specimen should be taken from the advancing edge of the lesion. Specimen taken from the center of a denuded area is histopathologically nonspecific and hence often requires a second biopsy. The need for a biopsy after a positive TT is a debatable issue. Literature too seems to be divided on this issue. Biopsy is often considered as a gold standard for the diagnosis in pathology. Many authors believe that Tzanck smear only serves as an adjunct to routine histopathological examination. Yaeen et al. stated that sensitivity and specificity for Tzanck smear when compared to histopathology were 81.8% and 83.3%, respectively. They also stated that Tzanck smear gave 100% specificity for pemphigoid and hence serves to rule out pemphigus. Further histopathology can help to differentiate PV from pemphigus foliaceus, which demonstrates a more superficial epidermal split. DIF can be further used to confirm the diagnosis by identifying the presence of autoantibodies, tissue complement, and fibrinogen. Although the diagnosis can be achieved either by routine histopathology or DIF, it is recommended to perform both procedures. However, caution should be exercised when a patient is receiving drug treatment as false-negative results may come due to immunosuppressive drugs. Negative results can also be encountered during initial stage of PV when features are predominantly limited to oral cavity. DIF is best performed on a biopsy specimen that is taken from clinically normal-appearing perilesional mucosa. HF is an important diagnostic tool in autoimmune vesicobullous lesions and allows the evaluation of circulating autoantibodies. Indirect immunofluorescence is performed on patient's serum and is helpful in differentiating PV from pemphigoid. The titer of the antibody corresponds to the disease activity and hence can be used in follow-up of the patient during treatment. Cases of CPV are not commonly seen in clinics and hence can be overlooked in the differential diagnosis of the oral ulcerative lesions in children and adolescents. A careful and comprehensive clinical history along with TT and biopsy can help in clinching the diagnosis. This article attempts to emphasizes the fact that TT may act as an immediate adjunctive tool to establish a provisional diagnosis of certain vesiculobullous lesions, especially PV, the findings of which should be confirmed by biopsy and DIF. Asarch A, Gürcan HM, Ahmed AR. A current review of Juvenile pemphigus vulgaris: Analysis of data on clinical outcomes. Am J Clin Dermatol 2010;11:21-33. Gorsky M, Raviv M, Raviv E. Pemphigus vulgaris in adolescence. A case presentation and review of the literature. Oral Surg Oral Med Oral Pathol 1994;77:620-2. Mincer HH, Turner JE, Sebelius CL. Juvenile pemphigus vulgaris. Report of a case. Oral Surg Oral Med Oral Pathol 1975;40:257-60. Merchant S, Weinstein M. Pemphigus vulgaris: The eyes have it. Pediatrics 2003;112:183-5. Ljubojević S, Lipozencić J, Brenner S, Budimcić D. Pemphigus vulgaris: A review of treatment over a 19-year period. J Eur Acad Dermatol Venereol 2002;16:599-603. Chen IH, Mu SC, Tsai D, Chou YY, Wang LF, Wang LJ, et al. Oral ulcers as an initial presentation of Juvenile pemphigus: A case report. Pediatr Neonatol 2016;57:338-42. Ruocco V, Ruocco E. Tzanck smear, an old test for the new millennium: When and how. Int J Dermatol 1999;38:830-4. Sadick NS, Swenson PD, Kaufman RL, Kaplan MH. Comparison of detection of varicella-zoster virus by the Tzanck smear, direct immunofluorescence with a monoclonal antibody, and virus isolation. J Am Acad Dermatol 1987;17:64-9. Blank H, Burgoon CF. Abnormal cytology of epithelial cells in pemphigus vulgaris; a diagnostic aid. J Invest Dermatol 1952;18:213-23. Yaeen A, Ahmad QM, Farhana A, Shah P, Hassan I. Diagnostic value of Tzanck smear in various erosive, vesicular, and bullous skin lesions. Indian Dermatol Online J 2015;6:381-6. Challacombe SJ, Setterfield J, Shirlaw P, Harman K, Scully C, Black MM, et al. Immunodiagnosis of pemphigus and mucous membrane pemphigoid. Acta Odontol Scand 2001;59:226-34. Aoki V, Sousa JX Jr., Fukumori LM, Périgo AM, Freitas EL, Oliveira ZN, et al. Direct and indirect immunofluorescence. An Bras Dermatol 2010;85:490-500.